Ms. Tiffany M. Moore currently serves as Senior Vice President of Political and Industry Affairs for the Consumer Technology Association. 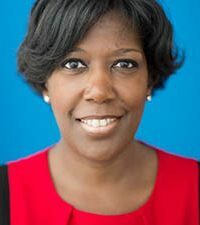 Promoted to the newly created position in April 2018, Tiffany’s expanded role includes overseeing CTA’s U.S. Jobs, and Diversity and Inclusion initiatives. In addition, Tiffany leads the association’s advocacy efforts on Capitol Hill on issues including communications and technology policy, patent litigation reform, strategic immigration reform and international trade, and overseeing CTA’s political action committee CTAPAC. Tiffany joined CTA as Vice President of Government and Political Affairs for the Consumer Technology Association in December 2015. Previously, Tiffany served as a government relations consultant to CTA as principal at Moore Consulting and strategic consultant with TwinLogic Strategies. In addition to CTA, Moore advised numerous corporate and association clients on how to influence technology and innovation policy before Congress and the Administration. Before launching Moore Consulting, Tiffany served as senior legislative advisor in the Legislative and Government Affairs Practice Group at Venable LLP. In 2006, Tiffany was appointed Assistant U.S. Trade Representative for Intergovernmental Affairs and Public Liaison at the Office of the United States Trade Representative (USTR) by Ambassador Rob Portman. In this role, Moore led domestic outreach efforts to American business, agriculture and consumer communities on the U.S. trade policy agenda and served as primary intermediary with governors, mayors and local elected officials on U.S. trade policy. Prior to joining USTR, Tiffany served as director of government relations for Kellogg Company and led legislative policy efforts around a broad array of issues including trade, food security, safety, tax and advertising as director, government relations. Tiffany began her legislative career working in a variety of roles in the office of U.S. Representative Fred Upton (R-MI), where she served as legislative director from 2000-2002. In January 2018, Tiffany was named to the Board of Trustees of the Consumer Technology Association (CTA) Foundation. Tiffany also serves on the Women’s Health Board of The GW Medical Faculty Associates dedicated to supporting the Mobile Mammography Program (Mammovan). In addition, Tiffany serves on the boards of the Faith and Politics Institute and the Washington Government Relations Group. A proud native of Detroit, Michigan, Tiffany earned her M.A. in International Affairs from George Washington University’s Elliott School of International Affairs, and her B.A. from Western Michigan University.